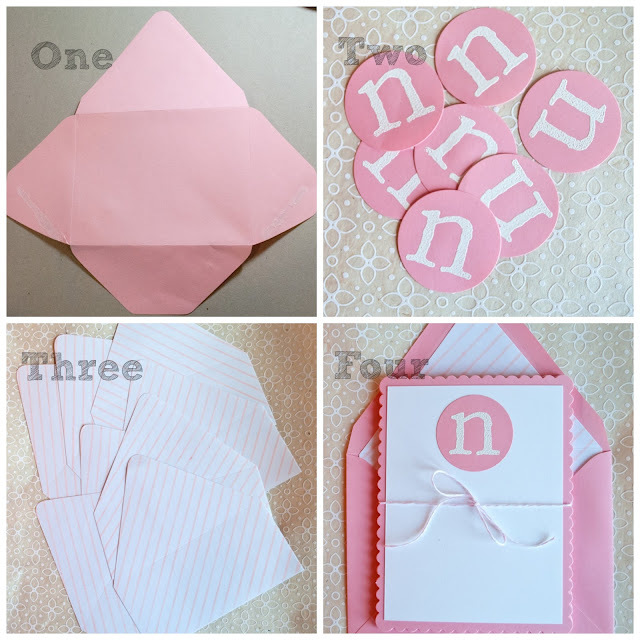 Here's a pretty set of 8 monogrammed flat note cards and coordinating envelopes. I love how these came out -- the scalloped base and the large lower case embossed monogram look great together. And here's a few pictures and "talk" to describe the process I used. 1. Opened up a Blossom Paper Source envelope so that I would have thinner paper for the monograms. 2. 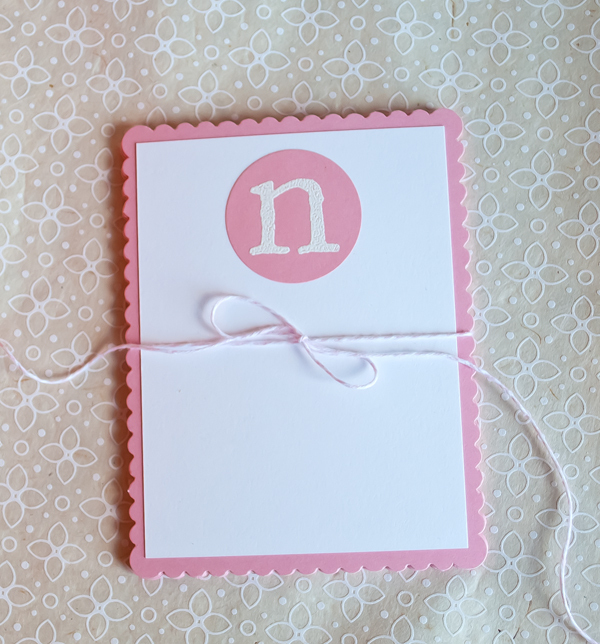 Stamped the "n" monogram in Versamark, embossed with Paper Source white embossing powder and die cut. Found this wood mounted stamp at Paper Source (yes, I am a 5 minute walk away....). 3. Stamped typing paper with Impression Obsession Diagonal Stripes in Versamagic Pixie Dust (perfect match with the Blossom line). 4. Put it all together using these Blossom A2scalloped flat note cards from Paper Source and matching envelopes. Those pre cut scalloped flat cards come in a lot of beautiful colors. So cute! You could package them in clear plastic boxes? I use those a lot for my note card gift sets. Sharon sells them at the Stamp Simply ribbon Store. Those are so darn pretty! Love Paper Source....only 5 minutes away??? How wonderful! These are darling!! How fun that the store is only 5 minutes away! Yes, it just sits there every. single. day. daring me to come on over! OH! I think I'd be in a BIG heap o' trouble having a paper store so close by!! A pretty clear box, or a simple hand made box would be a nice way to present these as a gift. I'm thinking I need to CASE this and start making some teacher gifts! Good to see you are supporting your community businesses. It would be a lovely gift. Trouble with a super-sized capital "T". The nearest one to me is in Big City (tough parking, tougher traffic) an hour plus drive for me. I try not to check them out online very much, either, in an effort to preserve the contents of the wallet. Defintely got the style going for you with this set.